Overlooking The Town Of Port Antonio Just 10 Minutes Drive Away, Hotel Mocking Bird Hill (Jamaica) Offers Guests Quiet, Peaceful Surroundings. The Mocking Bird Hotel features many complimentary services including shuttle to Frenchman's Cove Beach, use of snorkeling equipment, e-mail access and evening turn- down service. Guests can relax by the outdoor pool, check up on the latest international news in the library and dine on nouvelle tropical caribbean cuisine in the on-site restaurant. Guestrooms feature white tile floors, handcrafted bamboo furniture, original artwork and splendid ocean views. The breeze-cooled rooms have fans-and blankets for the cool winter nights. Tropical plants, attractive floral fabrics and hammocks add a touch of caribbean flair. Other amenities include in- room safes, coffeemakers and bathrobes. 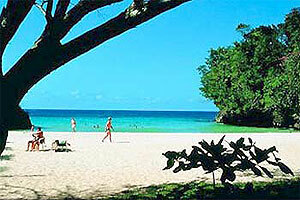 Hotels.com and Visitnegril.com haved teamed up to save you money on your next hotel stay. You can now book online here at visitnegril.com and get Special Internet Rate Price that are Guarantee to be the lowest you will find on the Internet!